I had the opportunity recenlty to attend a lecture by Edward Tufte in San Francisco. I entered not knowing what to expect, and I suppose my expectation was that I would be taught a set of practical tactics I could use in my day to day work. I was wrong. If you are looking for a course to pick up skills and techniques you can "copy and paste" to level up your presentation, this probably isn't the course for you. But if you are interested in some inspiration so you can become more effective through your own creativity, you may like the talk. Data presentation should be all about the content. The chrome should be eliminated. Everything in a presentation should better illustrate the content. A line separating things should have meaning about the content. An arrow between items should imply a verb... or even have an explicit annotation giving the arrow meaning. Can you step back, stand in the viewers shoes, and draw the intended conclusion from the evidence provided. Another nice quote. He stressed not only the responsibility of the presenter, but also the responsibility of the viewer. 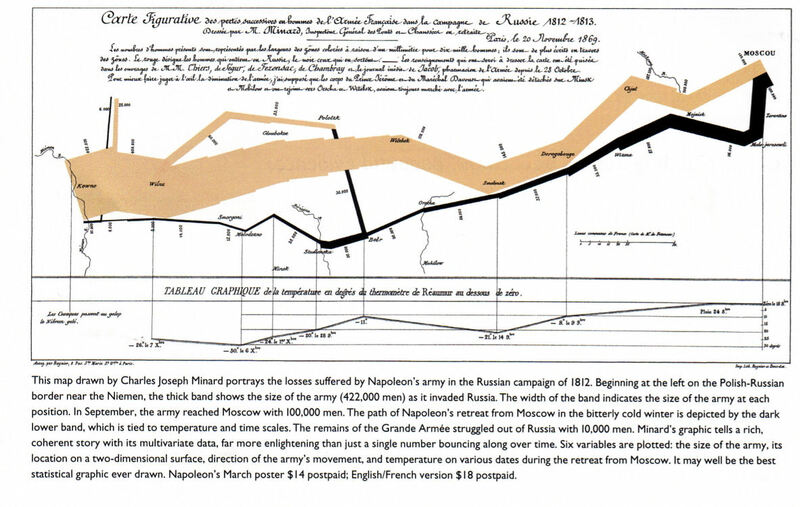 Tufte liked this visualization a lot and explained "everything on this visualization is about the soldier... the temperature, location, deaths, etc is all information about what happened to the soldiers." An interesting aside is that this was an anti-war illustration and the designer used the simple facts to illustrate the point. I liked this image as well and I bought a poster of it that he was selling. Prefer using space rather than time to present related data... Yes to one big (well illustrated) graphic, No to powerpoint deck. Let users see the big picture in one space that they can explore at their pace rather than making them wait for you to feed them information tiny bit by tiny bit over time.